The weather was perfect—no mud, freezing rain, and no excessive temperatures or blowing dust either. The big audience was wonderfully civilized and rich in families. There were bands from all the generations that make up our lives—Peter Rowan bringing with him a link straight back to Bill Monroe not to mention Jerry Garcia, our geezerly selves of course, and then a band made up of young folks who, as one of the lead singers said, attended her first Wheatlands when she was a month old and had attended every one since. 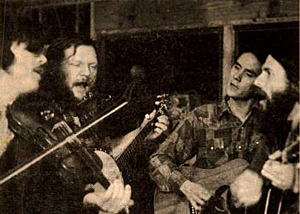 There was a bit of Jerry Garcia in their band too—since it must be remembered that Jerry was among many things a banjo player well aware of the world of acoustic music. There was great cajun music straight from Lafayette, there was a Quebeqoui singer-songwriter, and some tasty latino band music. The legendary Freight Hoppers were there, a mere step or two short of the most amazing band I ever witnessed on a Wheatlands stage, The Henries (“Hey hey we're the Henries, and we've got something to say”).